Climb on board the Wunderbus, the updated edition of Wunderkeys is here! Created by Andrea & Trevor Dow, this method is an early childhood method for music education. The series focuses on early musical concepts with fun and engaging games, rhymes, songs and off-the-bench activities. All along the way, students are building an awareness of crucial musical elements like hand-eye coordination, spatial reasoning, rhythm, sequence, pattern recognition, early math & counting skills and so much more. And it is perfectly paced for preschool students ages 3-5. Not only is the music part great, but it is also just plain fun. 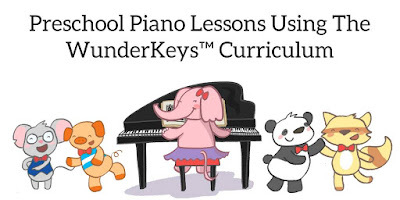 Join Thumbelina, Pointer Panda, Middleton Mouse, Ringo and Pinky Pig as they explore the fundamentals of music and keyboard theory together in an original and truly engaging way. Looking for a way to round out your child's music education? Or to squeeze in some practice when you are away from the piano? Just peruse your local library or bookstore's performing arts section. I headed over to Vroman's last week to see what was available and found some great choices! I was also glad to see some of my long-time favorites are still in print. This list is mostly picture booksmeaning that if you read the book, then went on YouTube and listened to the artist or piece you read about, these would be a perfect fit to substitute for a 15-20 minute practice time. In light of the 100 day challenge we are running for the 2017-2018 school year, I'm sure many of you are wondering, "but what about when I'm on vacation, or don't have a piano handy?" Well, you could always try fitting the piano in your car (or getting a portable Roll-Up Piano) but just in case that doesn't work, never fear! We've got lots of "off-the-bench" ideas so you can stay on track for your challenge! We are really excited to introduce two practice challenges for the 2017-2018 school year! 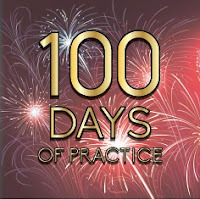 Each student will choose between a 100 day surge challenge, or a 40 piece challenge (they can of course do both if they are feeling really ambitious). And there will be incentives! But before I get ahead of myself, let me explain these challenges.